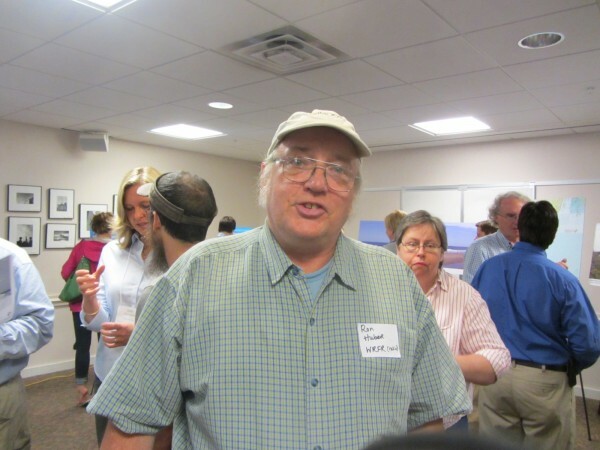 Ron Huber, an environmental activist from Rockland, attended the public informational session Tuesday afternoon in Rockland on the proposed commercial wind power project off Maine. ROCKLAND, Maine — Public sentiment was generally supportive Tuesday night on a proposal by a Norwegian company to erect four wind turbines about 14 miles off the coast of Boothbay Harbor. Statoil North America, which is a subsidiary of a European energy company specializing in petroleum, has applied for approval to place the turbines on leased ocean grounds as a pilot project that would begin in 2016. The company held the second of three open houses Tuesday afternoon at the Rockland Public Library. “I’ve been enthusiastic from the beginning if it is compatible with other uses,” said state Sen. Christopher Rector, R-Thomaston. The state senator, who represents most of Knox County, said the state should capitalize on the native talents and skills of local residents in the ocean wind projects. Sherman Hoyt of St. George, who has been active in a regional shellfish management program, said there is a need for renewable energy resources. The.wind power industry also could produce a tremendous amount of jobs along the coast, he noted. Hoyt said the only thing he would want to see is that the people in the fishing industry have a role in determining where the turbines will be located. Ron Huber of Rockland, an environmental activist, said he does not view himself as a supporter or opponent. Huber said he has concerns about four turbines in close proximity and the impact it could have on water currents, lobsters and other marine life. Huber had fought in court but lost an attempt to block a proposed pilot project by a consortium including the University of Maine for a turbine off Monhegan Island. The commercial pilot project is located in federal waters. Huber said he has seen proposed designs which also minimize the visual impacts of such turbines. He said, however, he was attending the meeting to gather information. The company, which calls its project “Hywind Maine,” also is seeking permission to connect to the ISO New England power grid. Statoil held a similar session Monday in Boothbay and will hold another at 4 p.m. Wednesday at the Gulf of Maine Research Institute at 350 Commercial St. in Portland. Most of the more than 70 people at Monday’s meet-and-greet were in favor of the project.